The Center for Predictive Integrated Structural Materials Science (PRISMS Center) is creating a unique framework for accelerated predictive materials science and rapid insertion of the latest scientific knowledge into next-generation ICME tools. There are three key elements of this framework. 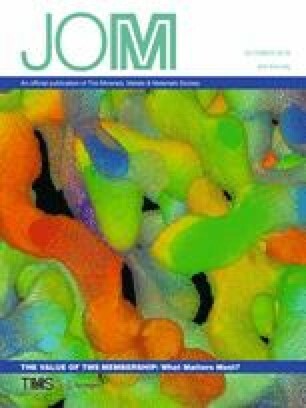 The first is a suite of high-performance, open-source integrated multi-scale computational tools for predicting microstructural evolution and mechanical behavior of structural metals. Specific modules include statistical mechanics, phase field, crystal plasticity simulation and real-space DFT codes. The second is the Materials Commons, a collaboration platform and information repository for the materials community. 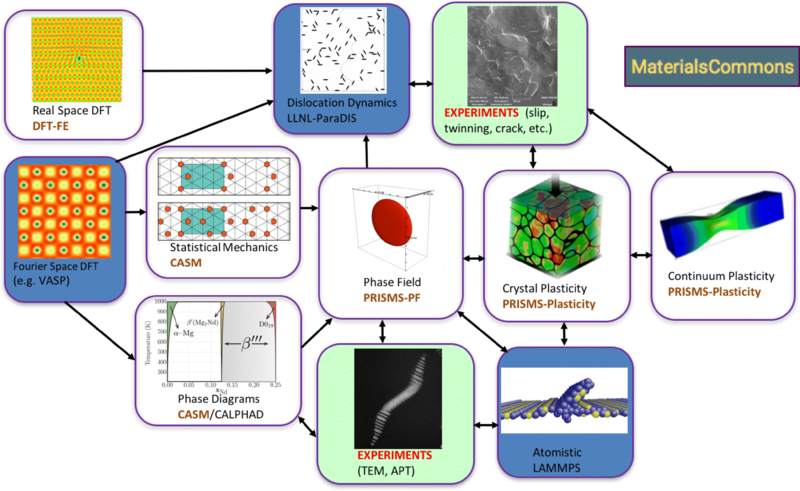 The third element of the PRISMS framework is a set of integrated scientific “Use Cases” in which these computational methods are linked with experiments to demonstrate the ability for improving our predictive understanding of magnesium alloys, in particular, the influence of microstructure on monotonic and cyclic mechanical behavior. This paper reviews progress toward these goals and future plans. The materials field has benefited significantly from major advances in mechanistic understanding enabled by the development and application of computational methods. However, these advances have not translated into a general reduction in the time required to develop new materials. Multi-user, professional level software such as VASP and open-source codes such as Quantum ESPRESSO1 have been developed in Europe where long-term funding for professional level software development has been a priority. In contrast, the materials science software developed at U.S. universities has largely been designed for use by individual research groups and close collaborators. This fragmentation and the lack of a framework for building integrated platforms, software and services have limited the evolution and wide availability of advanced predictive approaches. While the long-range goal of making the materials field more computationally oriented and holistic has been well articulated,2 there is no generally available, integrated set of computational software for developing and capturing materials information to make it available for developing new theoretical understandings or for use in engineering design. The Materials Genome Initiative (MGI) established that the acceleration of the process of materials discovery and development is a major national need, and identified the development of open-source software and a materials information infrastructure as important goals of MGI.2 Development of community-based open-source, computationally efficient and integrated codes is a major opportunity for rapid advancement of computational materials science and engineering and is a primary focus of the Center for Predictive Integrated Structural Materials Science (PRISMS Center) described in this article. The PRISMS Center was established in 2012 and is a multi-year, multi-investigator activity funded by the U.S. Department of Energy Basic Energy Science flagship MGI program “predictive theory and modeling”. PRISMS Computational Software Develop and establish PRISMS Software, a suite of integrated, open-source multi-scale computational tools for predicting the microstructural evolution and mechanical behavior of structural metals. The Materials Commons Develop and deploy the Materials Commons, a virtual collaboration space and repository for curating, archiving and disseminating information from experiments and computations. PRISMS Integrated Science Use Cases Significantly advance the science of metals by integrating the use of PRISMS computational tools with advanced experimental methods focused on specific scientific challenges. The use cases described here demonstrate the application of the integrated PRISMS capability for making major advances in the quantitative and predictive understanding of microstructural evolution and mechanical behavior of metals and alloys. The architecture of the PRISMS integrated framework is shown in Fig. 1. This framework, and associated computational tools and protocols, were designed to become a widely adopted, core scientific methodology that forms a common basis for the rapid development of new materials science and insertion into the growing field of Materials By Design/Integrated Computational Materials Engineering (ICME).2, 3, 4, 5 This framework builds on the substantial efforts of previous researchers in the area in ICME, multi-scale modeling and materials information e.g., Refs. 3, 4, 5, 6, 7, 8, 9, the review of which is beyond the scope of this article but which have been reviewed elsewhere e.g., Refs. 10 and 11. The PRISMS framework is substantively different than these preceding efforts in that it incorporates an integrated suite of open-source software and a materials information repository to make this framework accessible and usable by the broad materials community. We envision this as providing a strong, uniform basis for accelerating the development of next-generation ICME capabilities. While other open-source codes are available in targeted areas e.g., Refs. 12, 13, 14, 15, 16, 17, they have not been integrated with other tools as accomplished here. Magnesium (Mg) and its alloys serve as a prototype materials system for demonstrating the capability of the PRISMS framework and the scientific advances it enables. The behavior of Mg alloys presents a wide array of unsolved scientific challenges, including complex precipitation reactions, dislocation interactions in this hexagonal close-packed (HCP) system, twin formation and growth and the influence these deformation modes have on tensile and fatigue behavior. Compared to other structural metals, the development of commercial Mg alloys and our understanding of Mg alloy physical metallurgy is less mature. While alloys of aluminum and nickel can contain five to ten alloying elements, Mg alloys have remained simple and are typically based on only two or three alloying additions. Mg alloys also have significant potential for reducing the weight of automobiles and other transportation systems, and thus for improving fuel economy and reducing emissions. Many of these potential applications require significant improvements in strength, fatigue and corrosion resistance. Adoption of an ICME or Materials by Design approach for rapid development and insertion of new Mg alloys into the transportation industry is a major MGI opportunity. Developing a capability for enabling the rapid assessment of such advanced alloys is a central focus of the PRISMS Center. This paper provides an overview of the PRISMS Center progress and future directions. For additional information we refer the reader to our published papers and the Center website: http://prisms-center.org/. Currently, four primary codes make up the PRISMS open-source integrated software: CASM, PRISMS-PF, PRISMS-Plasticity and DFT-FE. Three of these codes (CASM, PRISMS-PF, and PRISMS-Plasticity) were released in 2015 on GitHub, and major updates have been released annually since. These codes are now considered to be stable and to significantly advance the state of the art. Where feasible, benchmarking, including use of standardized benchmark problems,18 has demonstrated that their computational efficiency is superior or equivalent to other open-source codes at similar levels of sophistication and capability. As of March 2018, the GitHub pages for these codes have been viewed over 48,000 times, and over 855 unique clones (copies) have been downloaded by users. Figure 2 shows the number of downloads over the past 3 years. The PRISMS user and code developer community is growing in the U.S., Europe, Asia and Australia. The PRISMS software is developed under the open-source LGPL license. Each software package includes a substantial user manual, commented source code and unit tests. As part of our annual workshop described below, we have trained more than 100 users over the past 3 years. DFT-FE, the fourth of the primary PRISMS Software codes, was released in August 2018. It is an advanced, finite element-based real-space code for density functional theory (DFT) calculations. Finally, two sets of integration software, PRISMS-IntegrationTools and PRISMS-Jobs, have been developed and released to handle interactions between PRISMS codes, Materials Commons, and computing clusters. Three of the PRISMS codes (PRISMS-PF, PRISMS-Plasticity and DFT-FE) use the finite element method in their calculations and are built on the powerful and popular deal.II finite element library.19 The deal.II library provides adaptive refinement of distributed octree meshes, hybrid parallelism (combining MPI, threads, and vectorization) with demonstrated scaling for over 16,000 processors, spectral finite element basis functions of arbitrarily high order, and support for matrix-free calculations. The deal.II library supports a wide variety of quadrilateral (2D)/hexahedral (3D) element types, including standard Lagrangian elements and Gauss–Lobatto elements. PRISMS Software provides the materials community with a user-friendly interface for phase field, crystal plasticity, continuum plasticity and real space DFT simulations with the advanced capabilities of the deal.II library. The rational and directed design of new materials must invariably rely on a robust and self-consistent description of thermodynamic and kinetic properties within a given chemical composition design space. Crucial in such descriptions are free energies, as they are essential to establish phase stability. Free energies also encapsulate all other thermodynamic information about a system in the form of first and second derivatives, including chemical potential versus composition relationships, heat capacities, and elastic moduli. Kinetic theories, such as generalized phase field models, also rely on free energies along with kinetic coefficients of unit processes that include diffusion and interface migration to describe microstructure evolution and corrosion processes. A major goal of this effort is to connect the electronic structure of a material to its finite temperature thermodynamic and kinetic properties. The statistical mechanical approach being employed for multi-component crystalline phases relies on effective Hamiltonians to account for configurational and vibrational degrees of freedom (i.e., cluster expansion and lattice dynamical Hamiltonians).20, 21, 22, 23, 24, 25, 26, 27, 28 Effective Hamiltonians serve to extrapolate accurate first-principles electronic structure calculations within Monte Carlo simulations to enable the calculation of thermodynamic quantities. PRISMS-PF51 is a general-purpose open-source framework for phase field modeling using the finite element method. It has 22 pre-built applications, covering common uses of phase field modeling from spinodal decomposition to dendritic solidification (see Fig. 3). PRISMS-PF includes a state-of-the-art application for precipitate modeling used extensively in the Precipitate Evolution Use Case described below.52,53 This application features a KKS phase field model coupling to linear elasticity, including heterogeneous, anisotropic elastic constants and composition/order parameter-dependent misfit strains. It also supports separate order parameters for different precipitate variants. All PRISMS-PF applications have access to its nucleation capabilities, which leverage the order-parameter-only explicit seeding approach,54,55 allowing an implementation of a user-specified nucleation probability density model (e.g., classical nucleation theory) to stochastically insert nuclei. PRISMS-PF is divided into three components: the applications, the core library, and the test suite. Most users only need to interact with the applications component, often through a parameters file where numerical and model constants are set. Users may also customize the governing equations, initial conditions, and post-processing expressions. The core library component handles functionality shared between all applications including the finite element calculations as well as input-file parsing, mesh creation, and output of results. Finally, the test suite component includes unit tests, regression tests, and analytic solution comparisons for code verification. Even without the activation of adaptive meshing, the other four performance-enhancing aspects of PRISMS-PF enable it to be twice as fast as a standard single-purpose MPI-parallelized finite difference code.51 With adaptive meshing activated, but under conditions unfavorable for adaptive meshing, PRISMS-PF is still seven times faster than a finite difference code. The PRISMS-Plasticity code is a parallel numerical framework for implementing continuum and crystal plasticity models. It is developed on a base framework for parallel implementation of elliptic boundary value problems using the deal.II open-source finite element library. For crystal plasticity, we have implemented HCP, BCC and FCC single crystal elasto-plastic constitutive models. For continuum plasticity, von Mises plasticity with J2-flow theory, isotropic and kinematic hardening are included. The current implementation is for quasi-static conditions; however, deal.II allows both dynamic and explicit implementations which may be the subject of future developments by the PRISMS Center or external open-source collaborators. Using experimental or synthetic 3D polycrystalline representative volume elements (RVE) as input, the crystal plasticity finite element (CPFE) code can compute the anisotropic response of crystalline aggregates to large-strain quasi-static mechanical loading in the form of grain-level stress contours and pole figures. The material deformation is solved based on a constitutive response driven by mechanisms of dislocation slip, twinning and crystal reorientation. The evolution laws for micro-scale state variables, namely, slip and twin system resistances are based on previous work.60, 61, 62, 63 Twin reorientation is tracked using the predominant twin reorientation (PTR) scheme64 at the level of individual elements. The code has the capability to read in microstructures created by DREAM3D and NEPER, popular packages for microstructure generation, and supports both structured and unstructured grids. The parallel code output can be imported by software such as ParaView for visualization and to generate movies. The code output can be read in by PRISMS Center-provided scripts or by external codes for post-processing to pole figures and orientation distribution functions. Additional capabilities include handling of two-phase materials and a back-stress implementation for modeling cyclic loading (Fig. 4). Code efficiency has been significantly improved using a new iterative procedure to compute active slip systems that ensures all slip systems lie on or within the single crystal yield surface. The algorithm also includes adaptive time stepping to speed up calculations and has allowed significant improvements in convergence in non-linear finite element iterations. PRISMS-Plasticity has been demonstrated on large-scale problems with millions of degrees of freedom running on thousands of processors. An example of such simulations is shown in Fig. 4, which took only 96 CPU-h. The microstructural strain response predicted by the PRISMS-Plasticity CPFE module has been validated by comparison with strain maps from SEM-DIC measurements, and it provides a reliable indicator of stress heterogeneity within grains as well as Schmid factor variations due to the effect of neighbor grains.65,66 The crystal plasticity code has been used for computation of dislocation density distribution for use in static recrystallization models67 and for initializing the single crystal parameters of other alloys (Ti, Al, Fe)68, 69, 70 in projects outside the PRISMS Center. New features under development for PRISMS-Plasticity include advanced capabilities such as gradient plasticity and 3D fracture simulation in additional to upgraded models for twinning and grain size effects. Defects play a crucial role in influencing the mechanical response of crystalline solids, and examples include dislocations, solute impurities, precipitates, and grain boundaries. These defects, even when present in very small concentrations (a few parts per million), produce a significant macroscopic effect on the materials behavior through the long-ranged elastic fields that they generate. The strength and nature of these fields, as well as other critical aspects of the defect-core, are all determined by the electronic structure of the material at the quantum-mechanical length-scale. Hence, there is a wide range of interacting length-scales, from electronic structure to continuum, that need to be resolved to accurately describe defects in materials and their influence on the macroscopic properties of materials. Building on prior work, we have developed a framework for conducting large-scale real-space electronic structure calculations using Kohn–Sham density functional theory (KSDFT)71, 72, 73 (cf. Figure 5). Specifically, the capabilities developed in the DFT-FE code have been aimed at enabling studies of extended defects in materials that have been out of reach using existing state-of-the-art DFT codes using a plane-wave discretization. In particular, the developed capabilities have three key distinguishing features: (1) it is based on a real-space formulation and a finite-element discretization71 that allows for the consideration of general geometries and boundary conditions, which is important in studying extended defects such as dislocations whose geometry is not compatible with periodic boundary conditions; (2) the cubic scaling bottleneck of conventional KSDFT calculation is overcome by the development of reduced-order scaling methods,72 which are applicable to both insulating and metallic systems, and have enabled large-scale KSDFT pseudopotential calculations on systems containing ~ 10,000 atoms; and (3) the code has been demonstrated to scale well on parallel architectures, with over 90% efficiency on many thousands of processors. Open-source software based on some of these capabilities has been developed with the first public release of the beta version recently announced in August 2018. This release features the following capabilities: (1) periodic and non-periodic calculations using norm-conserving Troullier Martins and ONCV pseudopotentials and density-based exchange correlation functionals (LDA/GGA); (2) mesh-adaption capability based on p4est (an efficient implementation of a parallel octree data structure); and (3) computation of ground-state energy including geometry optimization. Integration of the PRISMS Software codes with each other, Materials Commons and external codes is an important aspect of the PRISMS framework. To accomplish this, the Integration Tools package was implemented as a generic interface for passing parameters into and out of the PRISMS codes, decoupling the mathematical and numerical representation of the parameters and their derivatives from their use. As an example, using Integration Tools, the PRISMS-PF code is written to use a free energy function and its derivatives, without knowing the specific form parameterized by CASM. The current version includes support for passing arbitrary analytical functions, including piece-wise functions, series expansions, and tensor products of series expansion for multivariate functions, and linear finite element interpolations. mechanoChem is a suite of codes for continuum-scale models of coupled, multi-physics phenomena governed by the partial differential. This code suite (v0.1) was publicly released on GitHub in September 2016, and is now under continuous integration and development by the Garikipati Group. These models are applied to initial and boundary value problems involving structural alloys, energy storage materials and other systems of current and future interest75, 76, 77, 78, 79, 80, 81 at length scales of ~ 100 nm to ~ 1 cm. The mechanoChem models and codes have been developed to take as inputs quantities such as free energy densities, elasticity tensors, reaction rates, and mobility and conductivity tensors. These quantities are computed by combining methods that operate at smaller length and time scales. The free energy densities can be computed by DFT followed by cluster expansions, the elasticity tensors by DFT, and the reaction rates, mobilities and conductivities by DFT, cluster expansions and statistical mechanics methods such as kinetic Monte Carlo. mechanoChem is a C++ library of Isogeometric Analysis (IGA) and Finite Element Method (FEM) codes to solve coupled, initial and boundary value problems of reaction-transport, elasticity, heat conduction and electrostatics. It is built on well-established, open-source parallel software libraries including deal.II, PETSc (parallel data structures, solvers and preconditioners), Trilinos (automatic differentiation, solvers and preconditioners) and PetIGA (IGA toolkit). mechanoChem also employs a hybrid parallel programming model of MPI + OpenMP + Vectorization, well suited for memory-limited multi-core architectures. In addition to the native capabilities of these libraries, mechanoChem also can interface with other codes, such as Gmsh and CUBIT for mesh generation, and is itself easily called by Python scripts in more complex workflows. The Materials Commons is a collaboration platform and information repository for the materials community.88 It aims to be a seamless part of the scientific workflow and has been designed to cover the entire data lifecycle, from data acquisition and sharing through analysis and re-use. 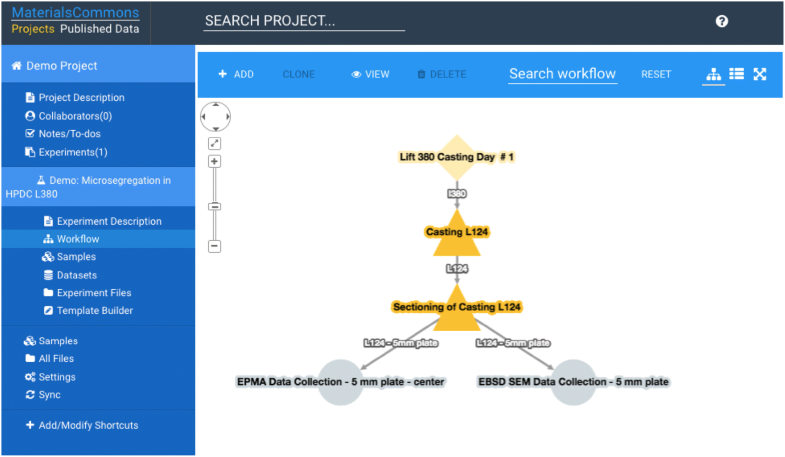 It provides a common site for researchers to store, share, curate, and re-use experimental and computational data, with a data model designed for the needs of the materials community. To accommodate different needs and use cases across the data lifecycle, the Materials Commons consists of a website, materialscommons.org, tailored for data sharing, discovery, organization, and collaboration, and a Python API and command line tool89 for data capture, metadata creation, and data analysis. Researchers using the Materials Commons start by creating a project that is shared with their collaborators. Using the website or Python API and command line tools, anyone granted access to the project can upload files to be shared amongst collaborators. Importantly, associated metadata, namely key data describing the scientific workflow and observed structure-processing-property relationships is stored in the database. An example of the electronic laboratory notebook representing an experimental workflow is provided in Fig. 6. Process templates describing what data are captured for each type of process (a particular experimental or computational test or analysis) provide data standardization and can be created via the website. These data can be automatically generated by parsing spreadsheets that have been annotated to allow Materials Commons to understand them, or by using the Python API to develop integrations with software packages or and analysis scripts. Once data are uploaded to the project, all collaborators can visualize the workflow on the website and output spreadsheets or use the Python API to query data for analysis. When ready, the entire project or a subset can be easily selected to be packaged into a dataset that is then given a DOI and made available to the wider community for download and re-use. A unique aspect of the PRISMS Center is our focus on quantitative prediction of alloying and processing effects on microstructures linked to properties. Establishing this predictive linkage is essential for accelerating the design and discovery of new materials and an important priority for the Center. The Center is organized around Use Case topic areas that serve as a central forum for scientific collaboration and for tightly coupling experimental activities with integrated multi-scale modeling. These Use Cases are meant to serve as demonstrations and test beds for how PRISMS Software, systematic experiments and Materials Commons can be used by others to rapidly advance science in structural metals. These Use Cases offer a means to partition the overall PRISMS framework into tractable problems addressing particular scientific, modeling and experimental challenges. We have made significant progress on three Use Cases: namely, Precipitate Evolution, Tensile Behavior and Fatigue Behavior of advanced magnesium alloys as described below. The Use Cases are designed to integrate and operate together. For example, results of the Precipitate Evolution Use Case are being passed to the Tensile Use Case for use in predicting the influence of precipitate variables on strength. Magnesium–Rare Earth alloys exhibit exceptional strength properties;94, 95, 96, 97, 98, 99, 100, 101, 102 however, they have been largely developed by traditional Edisonian techniques. We have thus focused our Use Case activities on the Mg-Nd-Y alloy system as an exemplar for the acceleration in fundamental understanding that can occur by tightly coupling experiments, theory and integrated multi-scale modeling. The objective of the Precipitate Evolution Use Case is to provide insight into the nano-scale precipitates that strengthen many alloys. 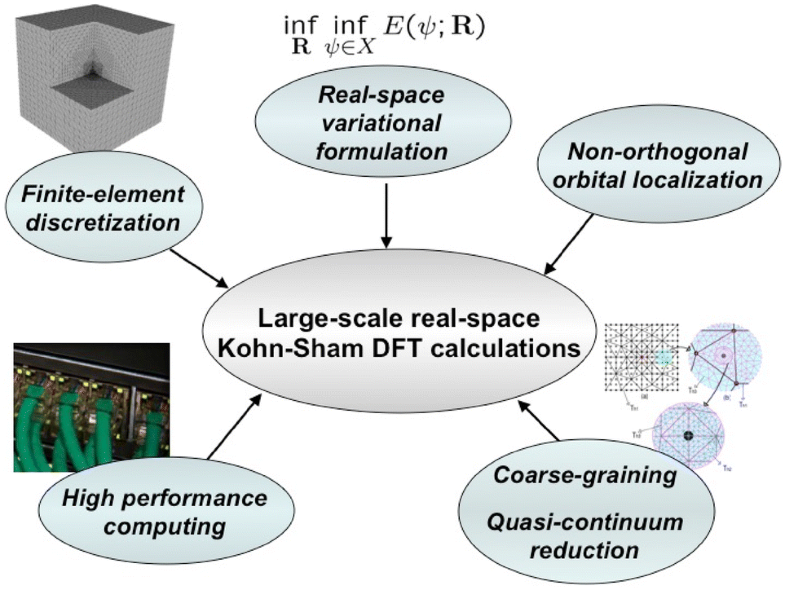 DFT, statistical mechanical, phase field, and dislocation dynamics calculations were combined with quantitative 2D and 3D experimental characterization to demonstrate an integrated platform that can predict precipitate microstructure and its influence on strength. This demonstration centers on the Mg-rare earth (Mg-RE) family of alloys, which have garnered increasing interest for structural components in automotive, aerospace, and portable consumer device applications.102 Optimal strength in these alloys is achieved by a complex and previously poorly understood precipitation sequence.100,101 It involves the nucleation of Guinier–Preston (GP) zones followed by the precipitation of metastable nano-scale HCP-based phases (historically referred to as β’). Further aging leads to the formation of BCC-based precipitates, referred to as β1, that form from and coexist with the original β’ precipitates. Since these precipitates are metastable and appear only in relatively new alloy systems, their thermodynamic and kinetic properties are not included in commercial thermodynamic databases. Following this work on phase stability in Mg-RE alloys, the precipitate composition, morphology, dimensions, and number density during aging were studied experimentally and computationally. In Mg-Nd, the shapes of GP zones and β’’’ precipitates were determined through atom probe tomography (APT), and the dimensions along two imaging directions of many β’’’ precipitates were measured with HAADF-STEM (Fig. 8a and b).107, 108, 109 Phase field simulations using PRISMS-PF and parameterized entirely from first-principles calculations yielded precipitates with a shape consistent with observations once the uncertainty in the misfit strains is taken into account52 (Fig. 8b and c). The phase field simulations also reproduced the elevated Nd composition indicative of the β’’’ ordering and confirmed the role of the large misfit strain in the stabilization of this ordering. A similar combined experimental and computational approach was undertaken to examine the βS’ precipitates in Mg-Y,110,111 and confirmed that the rod morphology can be largely attributed to the coherency strains predicted by CASM. β1 precipitates are another important strengthening phase in Mg-RE alloys. New PRISMS-PF nucleation model features were used to simulate the evolution of β1 precipitates in an Mg-Nd alloy through concurrent nucleation, growth, and coarsening112(Fig. 9), yielding results consistent with experiments. The results of these simulations are being mapped to dislocation dynamics simulations to serve as a linkage between the Precipitate Evolution Use Case and the Tensile Behavior Use Case as described in the next section. In the tensile behavior use case, the PRISMS Framework was extended to predict the influence of precipitate structure on yield strength and stress–strain response. This involves the integration of multi-scale models from atomistic simulations (Fourier and DFT-FE) with dislocation dynamics, crystal plasticity and continuum plasticity. This multi-scale modeling capability is integrated with unique experimental capabilities for measuring dislocation interactions with precipitates, grain-level strain distributions (SEM-DIC) and carefully designed experiments for quantifying the influence of alloying, grain size and precipitate structure on stress–strain response. Real-space DFT calculations are being used to determine energetics of isolated dislocations in aluminum and magnesium.113,114 At the dislocation-precipitate level, we are using the open-source code, ParaDiS,115 as the primary dislocation dynamics code to be integrated into the PRISMS Framework. A methodology has been developed to determine the critical resolved shear stress for dislocations moving on the basal slip plane through a given precipitate distribution. As an example, quantitative precipitate morphologies for an aged Mg-Al-Zn alloy were mapped to ParaDiS and the critical resolved shear stress determined.116 These results were combined with refined estimates of all other strengthening mechanisms and the computed estimates for yield strength were within 5% of the experimentally measured value. This demonstrated the feasibility of our integrated computational-experimental approach for predicting microstructural effects on properties. Results at the precipitate level were provided as inputs to the higher length scale represented by PRISMS-Plasticity. At this level, we have made extensive use of SEM-DIC120, 121, 122 to measure grain level strain maps. 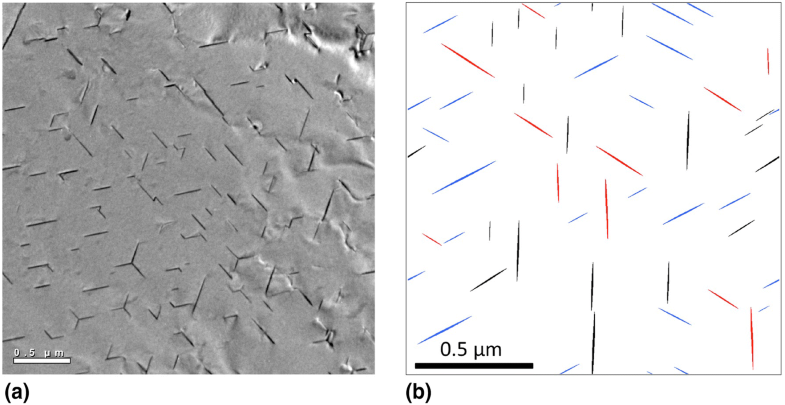 These strain maps allow us to gain insights into deformation mechanisms at the grain level and help in validation of the PRISMS-Plasticity crystal plasticity modules65 In the latter, we compare strain distribution on a microstructure predicted by PRISMS-Plasticity with corresponding high-resolution SEM-DIC data,123 an example of which is shown in Fig. 11(top) for an advanced Mg-Nd-Y alloy (WE43) compression test. 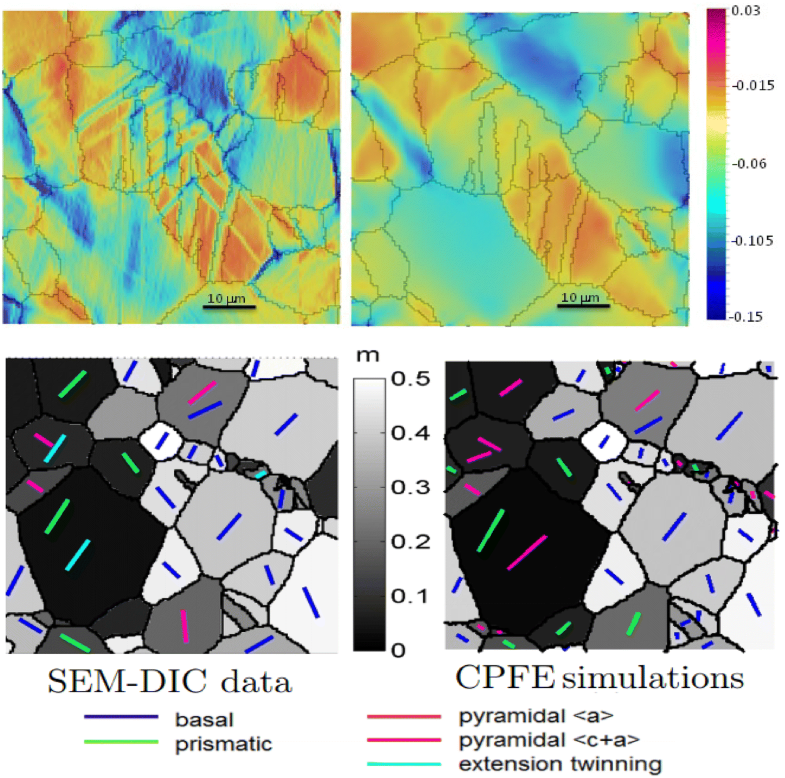 Using PRISMS-Plasticity (CPFE), tensile test data and an experimental EBSD (texture) map, we have reconstructed and tested representative polycrystals to develop crystal plasticity parameters for the WE43 alloy in two aging conditions (T5 and T6). This is similar to the approach used by Bhattacharyya et al.124 who have used integrated simulations to predict the influence of aging on flow stress and plastic anisotropy in WE43. In our current work, an interesting observation is that, in the T6 condition, pyramidal <a> is the least active mode, while in the T5 condition, pyramidal <a> appears to be a significant deformation mechanism (Fig. 11, bottom). This mechanism has been generally neglected in past studies on Mg-RE alloys. In addition, we can employ CPFE simulations to resolve traces of slip/twin systems that are close and cannot be readily distinguished. The integrated computational-experimental framework that has been established represents an important step in the direction of rapidly and accurately predicting alloying and microstructural effects on properties. Similar to the tensile use case, the fatigue behavior use case involved the integration of multi-scale models including dislocation dynamics, crystal plasticity and continuum plasticity, with comprehensive experimental results used to quantify the influence of alloying, grain size and precipitate structure on cyclic stress–strain response, low cycle fatigue crack initiation and short fatigue crack growth. Accounting for this cyclic twinning and detwinning is essential for accurately predicting the plastic strain that occurs during fatigue loading. These experimental results have been used to improve and parameterize the twin models used in the PRISMS-Plasticity crystal plasticity module and to predict the unique stress–strain loop shape associated with twinning and detwinning in Mg alloys, as shown in Fig. 12. To predict LCF life behavior, a novel dislocation dynamics simulation method has been developed.126 The method is energy-based and tracks the energy stored and dissipated in dislocation networks during cyclic deformation using ParaDiS. Another important demonstration problem is the growth of small fatigue cracks as they advance across grain boundaries in Mg alloys. A unique ultrasonic fatigue scanning electron microscope (UFSEM) was used to quantify the growth rates of cracks as they advance through grains and across grain boundaries.127,128 Focused ion beam notches were placed in grain neighborhoods with specific characteristics (e.g., Schmid factors, misorientation). Detailed analysis of crack initiation lifetime, small crack propagation rates, crack interactions at grain boundaries and crack pathways in each grain were characterized,129 an example of which is shown in Fig. 12. High-energy x-ray tomography and diffraction have also been used to characterize the 3D crack path trajectory.129 These will be used in conjunction with a new fracture model being implemented in the PRISMS-Plasticity code to understand and simulate the influence of microstructure on small fatigue crack growth behavior. These results were simulated using a new crystal elasticity and cyclic cohesive zone model for prediction of microstructural crack trajectories under high cycle fatigue130,131 or, in selected 2D cases, variational multi-scale modeling.73,132 The parameters of the cohesive law for crack propagation along various slip systems have been obtained using experimental (micro-beach marking) measurements of local crack growth rates within a grain.127 This is coupled with an analytical model for the effect of grain boundaries on crack paths, including prediction of grain boundary blocking or transmission of cracks under prescribed external loading based on tilt and twist angles made by the crack planes with respect to the grain boundary.131 The grain boundary effect is included in the fatigue crack growth model. 130,131 An example of the simulation and experiments is shown in Fig. 13. We have engaged in substantial outreach to establish the external PRISMS community, an essential function of the PRISMS Center. An important component of our outreach is the PRISMS Workshop, which has been held annually since 2014. This workshop includes a technical component and a training component. We attract international leaders in the field of multi-scale modeling and magnesium research to attend and present at this workshop. To date, over 150 researchers have attended this workshop, and over 100 researchers have attended a two- or three-day PRISMS Software training workshop. 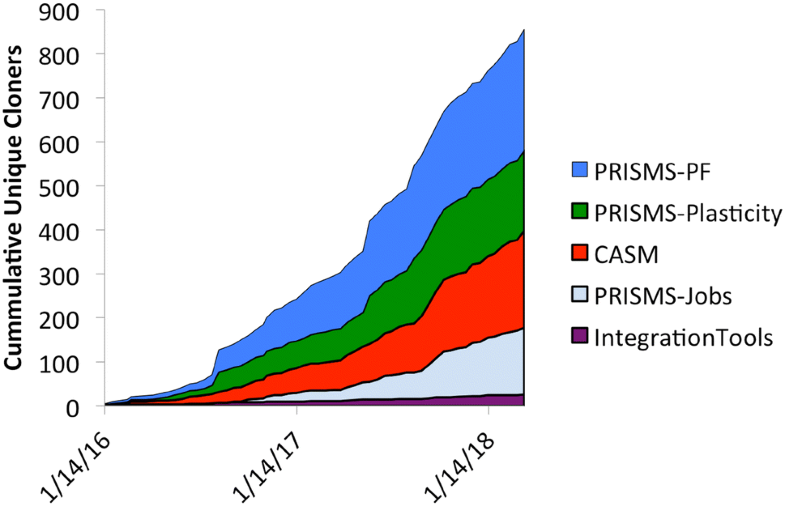 Many members of this growing community are becoming external collaborators with the PRISMS Center, either using or contributing to open-source codes or involved in collaborations. This article provides an overview of the PRISMS Center progress and activities. New integrated open-source, multi-scale PRISMS Software has been developed and made available to the broader community. A collaboration platform and information repository, the Materials Commons, has also been developed and made available to this community. All of these tools are continuously being improved and new versions released. These tools have been integrated into a framework of external software and experimental research to demonstrate accelerated development of fundamental understanding of thermodynamics and kinetics of precipitation and the effect of precipitate microstructure on tensile and fatigue properties of structural materials using Mg-RE alloys as a model system. Future directions include significant upgrades to all software tools and the Materials Commons. Our Use Cases will shift toward developing predictive capabilities for the combined effects of grain size and solutes on tensile strength, alloying and microstructural effects on corrosion and fatigue behavior, and complex alloy optimization of structural Mg alloys. The elements of the PRISMS Center comprise a comprehensive framework that can be used for accelerating a wide variety of materials developments. Although the PRISMS Center is focused on developing and demonstrating this capability for structural metals, elements of this capability can also be applied to energy and electronic materials. Many functional properties rely on or are strongly affected by the chemo-mechanical interactions that can be studied and predicted with the integrated multi-scale tools and framework of the Center. The PRISMS framework is being designed to enable rapid insertion of the most recent scientific advances into next-generation ICME capabilities and fulfill the vision of the Materials Genome Initiative. This work was supported by the U.S. Department of Energy, Office of Basic Energy Sciences, Division of Materials Sciences and Engineering under Award#DE-SC0008637 as part of the Center for Predictive Integrated Structural Materials Science (PRISMS Center) at University of Michigan. We also acknowledge the financial cost-share support of University of Michigan College of Engineering and Office of the Vice President for Research. The PRISMS Center supports methods development and software engineering in CASM. Methodology related to effective Hamiltonians to be implemented in future versions of CASM is supported by the National Science Foundation under Awards DMR-1410242, DMR-1436154 and OAC-1642433. The DFT-FE software development has in major part been supported by DoE-BES with the pseudopotential part of the work supported by the PRISMS Center and the all-electron part of the work supported by DE-SC0017380. National Science and Technology Council, Materials Genome Initiative for Global Competitiveness (Executive Office of the President, Washington, DC, 2011). http://www.whitehouse.gov/sites/default/files/microsites/ostp/materials_genome_initiative-final.pdf. Accessed 1 Mar 2016. The Materials Commons Python API, ‘materials-commons’, version 0.7.3. https://pypi.python.org/pypi/materials-commons. Accessed 15 Mar 2018. The Materials Commons. https://github.com/materials-commons/. Accessed 15 Mar 2018. Materials Data Facility ‘‘Data publication and data discovery. https://materialsdatafacility.org. Accessed 1 Mar 2016.